I recently started working with Calvert K9 Search, a local SAR team that specializes in using dogs to search for people. In an effort to improve communications between the command post (base) and teams in the field I embarked on a mission to find a simple solution to the problem of limited comms. There were several requirements that prevented the use of a repeater (added complexity, weight, setup time), using a higher power base station (may damage dog collar transmitters and GPSr receivers :sup:`1 <#footnote>`__ and only amplifies one side of the communication), or a portable tower (see repeater above). The solution was happened upon almost by accident and the improvements were immediately noticeable. Digging through the back of my car I came up with a VHF j-pole and fiberglass expandable pole to put it up in the air. A few adapters later and we were on the air! The performance improvement was immediate! Suddenly communications were possible at a much further distance and, when connected to the Garmin Astro 320, dog collars could be received from a much further distance away. Anyone who has examined the efficiency of a "rubber duck" antenna will know that these stock antennas aren't great and that almost anything is better. 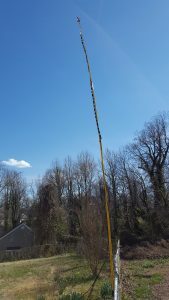 Stepping up to a j-pole antenna is a significant improvement and then putting that antenna up in the air has a lot of wow-factor to a non-radio person. With the tests complete I built two j-pole antennas: one centered on 155.160MHz, our primary operational frequency, and one centered on the average of all the MURS frequencies. The latter is used as a receive-only antenna for the dog collars and hangs below the VHF "ops" antenna. Both of these antennas are hung onto a fiberglass expandable pole that holds the antennas up in the air around 20 feet or so. 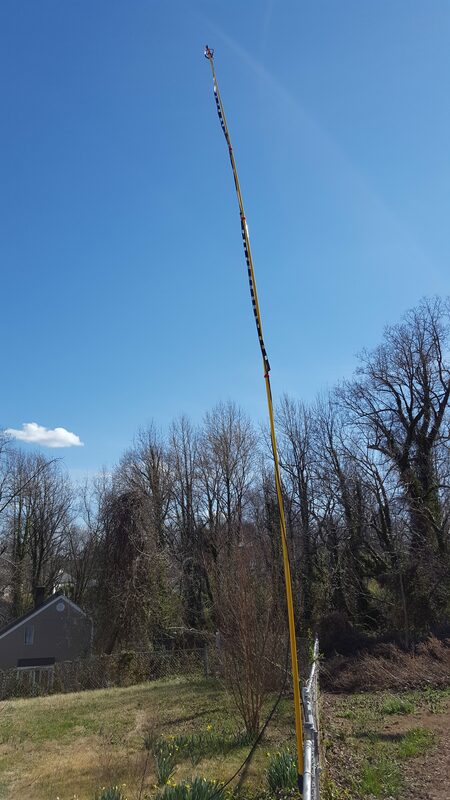 This pole can be attached to a fence post, command trailer, tent pole, or laid into a tree branch to keep it upright. The most expensive part of the project was the LMR-240 feedline :sup:`2 <#footnote>`__ that we used. The antennas were made out of 300-ohm ladderline with shrink wrap at each end to help keep the elements out. The pole is actually made for pulling cable and wires and is made by PushPullRods.com. It's really strong but isn't crush resistant so you have to be careful not to step on it when it's laying on the ground. For about the price of a good commercial antenna we were able to get a working antenna system that is completely portable/pack-able and lightweight and takes only a few minutes to setup and take down. It also doesn't take up much space for storage meaning it fits into the existing infrastructure without having to make changes. We've deployed this antenna system several times this spring and summer and have noted improvements over a variety of terrain. This project would have cost around $350 for parts if not for donations of parts and pieces along the way. 2. 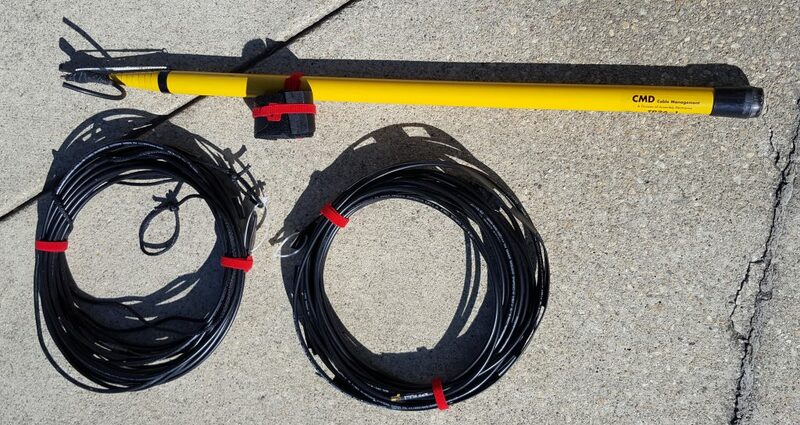 LMR-240 feedline was utilized as it was small, lightweight, and reasonably low-loss at VHF frequencies.